The Ministry of Foreign Affairs said in a statement that it “strongly protests” the US government’s decision to include Malaysia as one of 35 countries given a “K” indicator on April 9 in its travel advisory for this year. The indicator relates to “the risks of kidnapping and hostage-taking by criminal and terrorist actors around the world.” America raised concerns over the risk of potential kidnapping or hostage-taking situations in certain areas of eastern Sabah. The ministry said it has ramped up its security efforts with increased patrols, closer security cooperation with neighboring countries, and the strategic positioning of security assets in the areas mentioned, while urging the US to immediately remove Malaysia from the list. The state of Sabah is in the eastern part of Borneo Island, bordering Indonesia and Brunei. The island is close to Mindanao, in the southern part of the Philippines. Over the past few years, Sabah has been the site of several high-profile kidnappings for ransom by the Abu Sayyaf Jihadist group and other terrorist organizations from Mindanao. This month, a Malaysian fisherman died from gunshot wounds when he tried to escape from his Abu Sayyaf captors. He was reported missing along with two Indonesian fishermen in December last year. All three men were believed to have been kidnapped from their boat. Dr. Oh Ei Sun, a senior fellow at the Singapore Institute of International Affairs, told Arab News that despite the dire situation in Eastern Sabah, the travel advisory would not affect Malaysia’s tourism. ”To be blunt about it, this won’t affect Malaysia a lot, because most of the tourists who go to the surroundings of Semporna (in Eastern Sabah) are amateur or seasoned divers who will go there at all costs due to its designation as the world’s best diving spot,” he said. 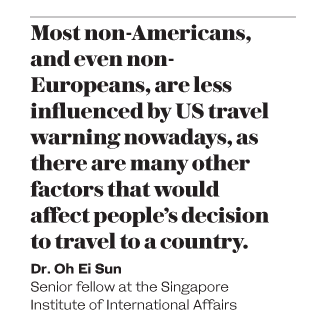 He added that most non-Americans, and even non-Europeans, are less influenced by US travel warning nowadays, as there are many other factors that would affect people’s decision to travel to a country. The other 34 countries given a “K” indicator in America’s 2019 travel advisory include Afghanistan, Bangladesh, Iran, Iraq, Kenya, Mexico, Nigeria, Pakistan, the Philippines, Syria, Turkey, and Yemen.